Moana is already a Disney classic and La La Land is receiving considerable buzz thanks to star performances by Emma Stone and a Ryan Gosling. 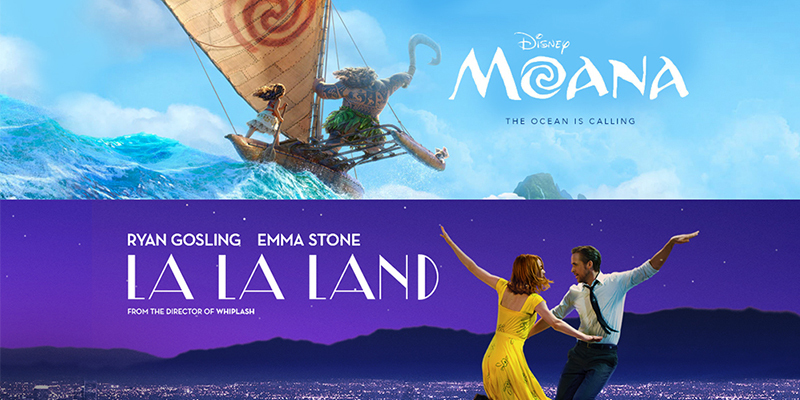 Read more about each movie below and download sheet music for each's most popular titles below. Fast-forward nearly 3 years later. Lin-Manuel Miranda is one of the most famous men in the world (thanks to the success of Hamilton) and Moana is being hailed as one of Disney's strongest animated movies, high praise given the company's history of classic movie music. The New York Post says Moana has some of Disney's best music ever. Listen to selections from Moana below and find the sheet music HERE. La La Land tells the story of Mia (Emma Stone), an aspiring actress, and Sebastian (Ryan Gosling), a dedicated jazz musician, who are struggling to make ends meet in a city known for crushing hopes and breaking hearts. Lead actor Ryan Gosling spent 4 months learning how to play the piano, and his daily practicing paid off: there are ZERO hand replacement shots in the entire movie. Emma Stone - who was starring in Cabaret on Broadway when she met director Damien Chazelle - delivers an equally impressive performance. Composer Justin Hurwitz (who previously collaborated with Chazelle on Whiplash), with help from lyricists Benj Pasek and Justin Paul, created a perfect jazzy and romantic score that transports you back to the golden age of Hollywood musicals. Listen to "City of Stars" from La La Land below, and find sheet music from the soundtrack HERE.